Trade supplies, brew potions, make money, and become the best apothecary you can be while preventing your fellow guild members from outshining you. The path to success is littered with compromise and mischief, but luckily you have your own supply of potions to gain an upper­ hand! Potions in Motion is a three to four player card game by Chuck Henslee, Léa Leroy, Yurie Murayama, and Glo Wan. Each player owns an apothecary that produces one type of Ingredient and they must trade with their fellow apothecaries to complete recipes, brew potions, and make gold. Bargain with your rivals for the best and most profitable deals in this game about cooperation and competition! 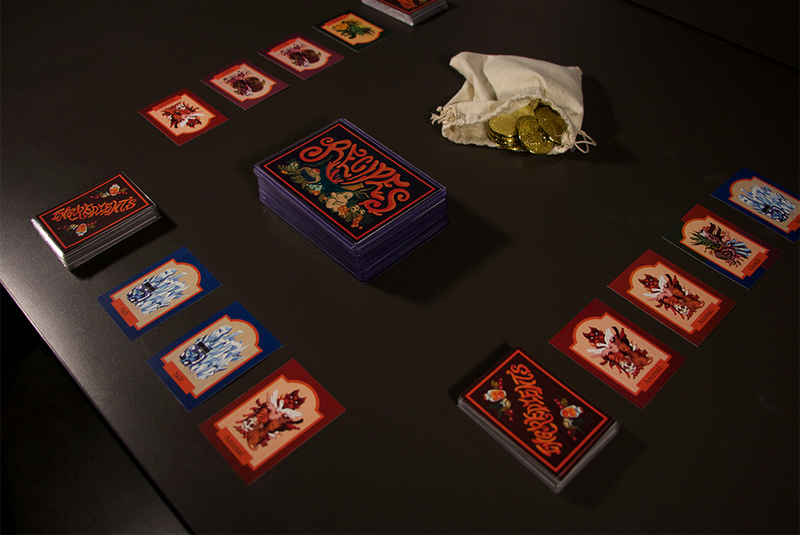 Potions in Motion was available to play during "Game Night at the Walters," at the Walters Art Museum, 2016. Recipe cards designed by Yurie Murayama and Glo Wan. Ingredient cards designed by Yurie Murayama and Glo Wan. Final Potion illustrations. Concept sketches by Chuck Henslee and Léa Leroy. Final paintings by Glo Wan. Final Ingredient illustrations. Concept sketches by Chuck Henslee. Final paintings by Glo Wan.